Your tablet-obsessed kid spending hours on the couch poking at a touchscreen probably isn’t doing their waistline any favors. 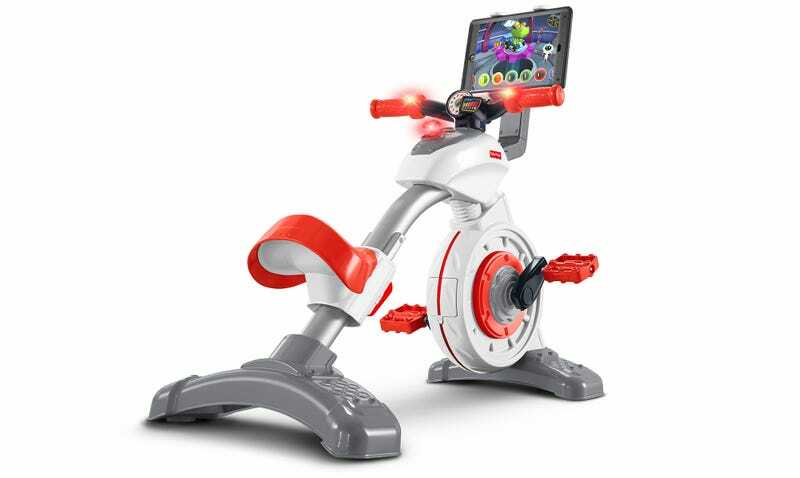 But instead of wrestling an iPad out of their hands, Fisher-Price wants to help battle childhood obesity with a tablet holder that’s essentially an exercise bike for kids. The Think & Learn Smart Cycle isn’t being marketed to kids as a way to help counteract their sedentary lifestyles. After all, what kid likes the idea of being forced to get up to get some exercise? As any parent knows, you have to outsmart a kid to get them to do what you want, and often that involves video games these days. By designing the Smart Cycle to be what is essentially a ride-on video game controller, kids can keep playing with their tablets while they’re improving their physical fitness. And if they happen to burn off a little excess energy in the process so bedtime is less of an ordeal, what parent is going to complain? Used on its own, the Think & Learn Smart Cycle wirelessly connects to a tablet mounted on its handlebars via Bluetooth, letting kids control one of four downloadable iOS or Android games through the speed of their pedaling. Fisher-Price promises more apps to come in the future, which will expand on the educational focus of the original four that help teach reading, match, science, and social studies. For a more immersive experience, the $150 Think & Learn Smart Cycle can also be connected to a larger screen using apps running on hardware like an Apple TV or smart televisions that support Android TV. And at any time parents can get a better idea of what their children are actually learning during their kid-friendly spin classes using a parental dashboard feature that’s built into each of the accompanying apps. Now if only riding a bike made kids want to eat their vegetables.